The story of my research retracing the lives of the Williamsons and the Kings begins in Shanghai. The three generations of the family all lived here for differing lengths of time at various points in their lives, and, like all foreigners in China in those days, they passed through the city on countless occasions. In 1910 Louis Magrath King was transferred to the British Consulate at Shanghai from the Legation in Peking, and, a hundred years later in 2010, I too would pass through the city en route to Kangding. But Shanghai is a starting point in more ways than one. I first visited Shanghai in March 2006 and returned in the summer of that year, staying for over a month. It was a fortunate coincidence that just as I began my research so too I was asked to make frequent trips to China to work in various museums there. It was a remarkable opportunity to connect archives and memories with real places. Many of these trips were up to a month long in duration, which meant I got to explore and understand several cities, such as Beijing, Shanghai, and Xi’an, quite well. It was during that first month long trip to Shanghai that I began to read up about the era of Western lead semi-colonial intrusions into China and Tibet. Naturally, whilst I was there, I also decided to read J.G. 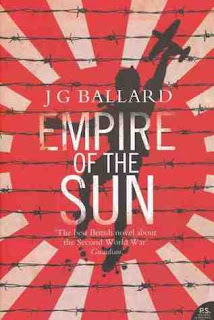 Ballard’s famous semi-autobiographical novel, Empire of the Sun (1984), which is set in Shanghai during the Second World War. I was already familiar with the story as Steven Spielberg’s 1987 film of the book had been one of my favourites whilst growing up – I even went in search of the runway built by the internees of the Japanese prison camp and retraced (as best you can in today’s modern metropolis) Jim’s walk from Lunghua Temple to the sports stadium (something perhaps to recount here in a future blog post sometime!). 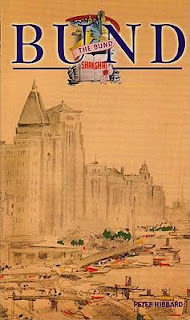 The novel certainly helped to kindle a growing interest in old Shanghai. When not working I’d spend my free time wandering around the streets between Zhōngshān Dōnglù 中山东-路 (the old Bund) and Rénmín Guăng Chăng 人民广场 People’s Square (the site of the old racecourse) where there are so many grand old buildings still standing from the era of the International Settlement and the French Concession; as well as the old shíkùmén 石库门 lanes of the original, and formerly walled, Chinese town. 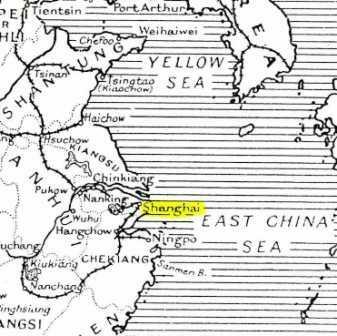 In the early 1800s Shanghai had been a small and relatively unremarkable Chinese settlement on the banks of the Huangpu River, which flows into the Yangtze close to where the great river flows into the East China Sea. The foreign powers were granted ‘extraterritorial’ rights to reside and trade at Shanghai, and so a small settlement grew up on the mudflats next to the Chinese town. Over time it grew into one of the premier treaty ports, with its own municipal council, its own police force and volunteer self-defence force. 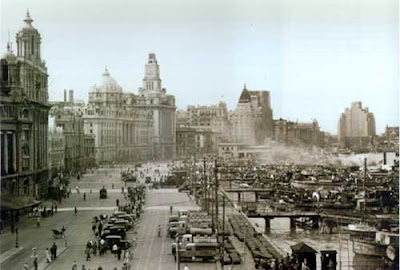 Foreign merchants, banks, trading and shipping companies began to thrive here, erecting ever more grand buildings, particularly along the waterfront of the Bund. Many of the most prominent and well-to-do settlers built themselves grand villas in which to live. Back then, according to some accounts, life in Shanghai – dubbed the “Paris of the East” because of its decadence – seems to have been a heady and rare old time. Many historians, Robert Bickers undoubtedly being the foremost among them, have chronicled the settlement’s history from its small-time beginnings, through its hedonistic hey-day when (to quote Jim Graham) “there was opulence”, and its brutal subjugation during World War 2, to its dwindling decline before the Communist Party seized control in 1949 and put an end to the outsider-controlled capitalist adventure there. Nowadays Shanghai is booming once again. Much as it was in the 1920s, the old ‘ultra-modern’ buildings fronting the Bund are today mirrored by the ultra-futuristic skyscrapers on the Pudong side of the river. And, asides from Hong Kong – of all the places I’ve been to in China, this is the city where foreigners and foreign business can most prevalently be seen. Shanghai is once again a world city – reawakened, reshaped, and, renewed. By the time I returned for my second month long stay in 2008 my research had significantly progressed. This time I went wandering the streets of old Shanghai with a better informed eye. This time I was looking for specific sites which I knew were connected to the Kings. I wanted to try to retrace the old city as they might have recognised it. Shanghai is now a forest of gleaming skyscrapers and palatial shopping malls, but there is extreme poverty sitting side-by-side with the extravagance, a disparity which would have been a familiar sight in the King’s time as well. The constant, vibrant bustle and hubbub of the shopping streets must have resonated much the same in their day as it does now. The tall Sikh policemendirecting traffic have long since been replaced by Chinese police officers. Hundreds of shabby looking taxis have replaced the old rickshaws. And almost all overseas travellers now arrive in these taxis from Pudong International Airport. In the days when the Williamsons and the Kings came and went here everyone would have arrived by boat. The Huangpu still teems with river traffic. Huge ships laden with all sorts of cargo, as well as river barges piled high with heaps of coal and so sunk perilously close to the gunwales doggedly motor up and down the busy channel from the point where the mouths of the Huangpu and the Yangtze meet before flowing into the sea. I took a boat down to this confluence point and back again, hoping to get a feel for what that initial arrival in Shanghai might have been like. It was fascinating to see all the shipyards along the river, busily employed in building vast ocean going vessels, between which crowded ferries still criss-cross the busy channel, and tiny fishing boats still sling their nets in the open waters close to the reed beds near the river’s mouth. At the mouth of the Huangpu in the midst of the channel there stands a lighthouse. I’m not sure how old it is, but judging by its architectural features it looks as though it has stood there a very long time, and it’s clearly still in use. It reminded me of Paul King, who mentions in his autobiography how he had helped in the first initiatives to light the Chinese coast, something which the Chinese Customs Service was charged with undertaking. Perhaps this was one of those original lighthouses? My boat rounded the lighthouse and began to head back up the river towards Shanghai. I watched even more keenly now to get a sense of which old buildings would be the most visible amidst the mushrooming mass of glass and steel towers. And surprisingly enough the Bund is still quite a sight to behold as you round the bend in the river and those majestic old buildings slowly grow in size as you draw closer and closer. I felt the trip had given me a good sense of what that arrival might once have been like, not least because our boat started and finished from a landing stage a short distance from the old HSBC building and the Meteorological Signal Tower – the old waterfront landing points of the Bund revamped and still in operation. 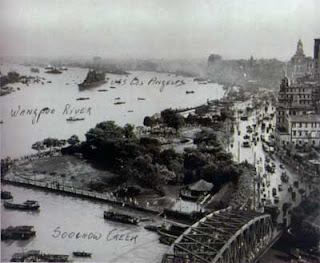 The old British Consulate is located at the far end of the Bund beside the ‘Garden Bridge’ which crosses over the Suzhou Creek where it flows into the Huangpu. When I first found the former Consulate in 2008 it was a derelict old wreck. Only being able to speak a few bare words and phrases in Chinese I mimed a request to be permitted to wander round the site and take a look, but was duly waved away by the tired looking man who sat sweltering in a booth watching over the gate. So I tried to get as best a glimpse of the place as I could from the outside and managed to take a few snaps of the crumbling and forlorn looking buildings. When I knew I was about to return to Shanghai in 2010 I contacted my friend, Peter Hibbard, who specialises in the architectural history of Shanghai, to see if he knew whether or not there might be a way to arrange a proper visit by which I might get to see inside. He replied with the unexpected information that the place was currently under renovation, and sure enough when I arrived in Shanghai and wandered over that way to take a look I was stunned to see the extent to which the place had been transformed. 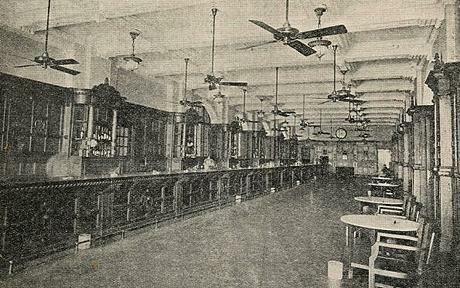 Part of the old compound had been bought by the Peninsula Hotel Company (the original Peninsula Hotel, which opened in 1928, can still be found not far from the waterfront on the Kowloon-side of Hong Kong harbour). The carefully manicured lawns of the old Consulate had been brought back to life along with the old buildings of the Supreme Court and Consular Offices and the Consul General’s residence, which has been stripped back to expose its exquisite original brickwork. This time I was happily waved inside and allowed to snap away merrily with my camera. The structural renovations of the old buildings were entering their final stages and I could see workmen busy inside starting to refit the stripped interiors. Yet sadly the buildings I was most hoping to see were all long gone. On my first visit I had been unaware of the buildings to the side where the junior staff of the Consulate had resided. I’d first found out about these from a set of Works Office plans which I’d dug out from the Foreign Office archives. This was the building in which Louis would have lived, and which, presumably, I might well have walked past (if it was still standing) during my previous trips to Shanghai, but which was now quite definitely gone – a gleaming modern multi-storey palace of a luxury hotel now stood solidly in its place. Still, it was marvellous to see the rest of the Consulate revived and put to use rather than let to rot and collapse, or to see it bulldozed and erased altogether. 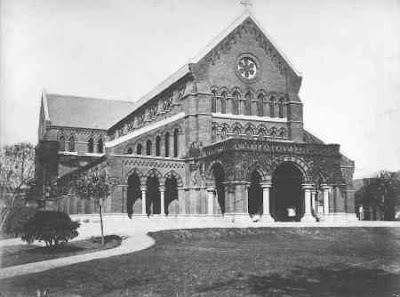 The Consulate, and the old Union Church building beside it (which had been gutted by fire in 2007), as well as the old Rowing Club (which Paul King had once been a member of), and the old ‘godowns’ and former Mission buildings along Yuanmingyuan Road, have all been restored as part of the general Shanghai renaissance which is still in the process of slowly transforming old Shanghai. Further along the Bund the old Customs House, which Paul King would have known well, especially when he had served as Shanghai’s Commissioner of Customs, was rebuilt in the late 1920s. This ‘new’ building still stands today and it is still used by the Chinese Customs Service, although sadly it’s not one of those buildings along the Bund which one is allowed to step inside to take a peek at its decorated lobby. DEAN: THE VERY REVEREND A.C.S. TRIVETT, M.A. B.D. B. LAWSON. R.F.C. MASTER, DR E.L. MARSH AND E.L. ALLEN HON. SEC. There are two names of interest which caught my eye here. The first is that of C.F. Garstin, and the second is Sir Sidney Barton. Charles Fortescue Garstin, the Acting Consul General, was Louis King’s brother-in-law (so in my finding this it was a case of one brother-in-law finding another!). Garstin joined the Consular Service shortly before Louis in 1901, and later they both fought in France during the final years of the First World War as officers in the Chinese Labour Corps. Sir Sidney Barton was Consul General at Shanghai, and, presumably, he may have been away (perhaps on home leave?) when the dedication ceremony took place, hence Garstin’s name appearing on the stone as Acting Consul General (he was later a full Consul General himself at Harbin). A few streets away is a mock ‘Tudorbethan’ style building, Macgregor House, which bears a similar foundation stone laid in 1937 by Sir John Brenan K.C.M.G – who by that time had succeeded Barton as Consul General. Brenan had joined the Consular Service in the same year as Louis King (a picture of Brenan can be found in Peter Hibbard’s The Bund Shanghai: China Faces West (2008), p. 154). I sat in here one afternoon in 2010 escaping from the intense summer heat, nursing a couple of cocktails whilst trying to picture what it would have been like when Louis was a frequent customer there. Instead I found my thoughts drifting back through my own long stays in Shanghai – so much had changed in the city in just those few years between 2006 and 2010. It’s rather remarkable that after all the changes, and the upheaval and austerity of the last 60 years, Shanghai is now seemingly drifting back to what it once was – perhaps again it was that ‘genius loci’ which Louis King so often remarked upon staking its claim once more? I couldn’t help wondering, what might remain of old Tachienlu (Kangding) almost a century after Louis first set foot there? It was only a matter of days – my flight from Shanghai to Chengdu was already booked – soon enough, I would have the chance to follow in Louis’s footsteps and find out.